TORRANCE, CA - February 1, 2019: The all-new 2019 Honda Passport begins arriving at Honda dealerships nationwide on February 4, filling out Honda's award-winning SUV lineup and delivering a unique combination of on-road driving refinement and off-road capability along with best-in-class interior space. The entry-level yet well-equipped Passport Sport carries a starting Manufacturer's Suggested Retail Price (MSRP)1 of $31,990 (excluding $1,045 destination and handling). Designed for adventure-seekers who want the exceptional on- and off-road capability of Honda's available i-VTM4™ torque-vectoring all-wheel drive system, the power and towing capability of its 280-horsepower 3.5-liter i-VTEC® V6, and the more personal and rugged character of a five-passenger SUV, Passport fits between the refined and compact CR-V and the larger, family-focused three-row Pilot. 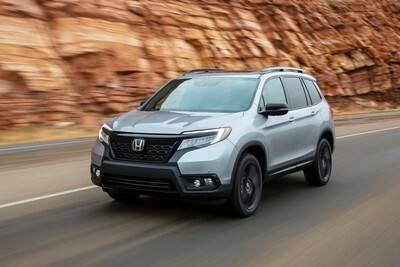 Using Honda's reinforced unibody Global Light Truck platform, the 2019 Passport features a fully-boxed floor structure, and the latest generation of Honda's proprietary Advanced Compatibility Engineering™ (ACE™) body structure along with a sophisticated fully independent suspension offering exceptional on-and off-road driving performance. Available in Sport, EX-L, Touring and Elite trims, all Passports come standard with 20-inch wheels, a blackout grille, the Honda Sensing® suite of advanced safety and driver-assistive technologies, as well as higher ground clearance and wider track than the three-row Pilot. Inside, Passport offers best-in-class passenger space and total interior volume and features a large "basement" cargo area ideal for storing dirty gear or keeping valuables out of sight. Key premium technologies available on Passport include in-vehicle 4G LTE Wi-Fi, Apple CarPlay® and Android Auto™ integration, a high-resolution 8-inch Display Audio system, heated and ventilated front seats, wireless phone charging, and more. The 2019 Passport is also available with a wide array of Genuine Honda accessories including the Adventure Package and Urban Package that provide cost-efficient ways to enhance the character and functionality of the new SUV. Other accessories allow Passport to accommodate a broad variety of outdoor gear, from bikes and kayaks to skis and snowboards. The all-new Passport was designed and developed by Honda R&D Americas in Los Angeles, California and Raymond, Ohio. The vehicle and its V6 engine are produced by associates at Honda Manufacturing of Alabama in Lincoln, Alabama, using domestic and globally sourced parts, alongside the Honda Ridgeline pickup, Odyssey minivan and Pilot three-row SUV. Honda offers a full line of reliable, fuel-efficient and fun-to-drive vehicles with advanced safety technologies sold through over 1,000 independent U.S. Honda dealers. The Honda lineup includes the Fit, Civic, Insight, Accord and Clarity series passenger cars, along with the HR-V, CR-V and Pilot sport utility vehicles, the Ridgeline pickup and the Odyssey minivan. Honda has been producing automobiles in America for more than 35 years and currently operates 19 major manufacturing facilities in North America. In 2017, more than 90 percent of all Honda brand vehicles sold in the U.S. were made in North America, using domestic and globally sourced parts. 1. MSRP (Manufacturer's Suggested Retail Price) excluding tax, license, registration, $1,045 destination charge and options. Dealer prices may vary. 2. Based on 2019 EPA mileage ratings. Use for comparison purposes only. Your actual mileage will vary depending on how you drive and maintain your vehicle, driving conditions and other factors. Complete specifications on these and other vehicles are available at the New Car Buyers Guide!